At Best Home & Property Services we pride ourselves on providing our customers with the best products, practices, and results available anywhere in the industry. Over the years, our patented waterproofing products and exceptional service have earned us many customer testimonials and referrals throughout South and North Carolina. Since , Best Home & Property Services has been dedicated to providing our customers with the best service from the first call onward. Our service to you does not end the day we complete the installation. At Best Home & Property Services, we like to follow up a few days after the work is completed to make sure that everything was complete the way it was proposed. At Best Home & Property Services, we'd like to help you transform your dark, damp, musty basement into the extra floor of usable, dependable space it's meant to be! Don't wait to reclaim your basement space! Call or e-mail us today for a free waterproofing quote! 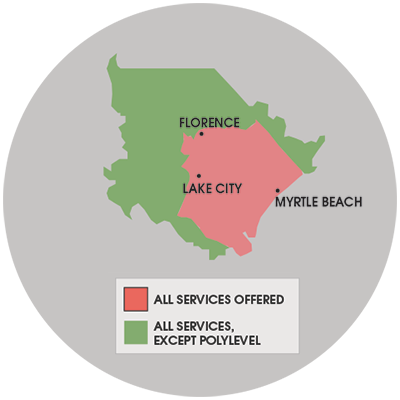 We service the South and North Carolina area, including Myrtle Beach, Sumter, Florence, surrounding areas such as Lancaster, Conway, Georgetown, Hartsville, Camden, Bennettsville, Darlington, and nearby.